Before... You were single. You loved the planet, you loved the nature, and you loved the animals. You loved to travel alone to places, far away from any human activities, to get closer look at the wild life and to feel connected to the Mother Nature. After... Years later, you are now blessed with the greatest joy of the parents as your baby is born. A newborn is so full of hope - so pure and so beautiful just like the nature. You have thoughts about sharing your love for the animals with your child when he or she grows up. Yet, you realized that many of these beautiful creatures would not be around by then. With every purchase of these organic clothes, you are making a difference not only in your child’s life but also the lives of the endangered species. Why Choose Organic Cotton Clothing for your newborn baby? • Reduce exposure to chemical - The organic cotton is grown without the use of chemical fertilizers, pesticides and insecticides. • Helps to prevent allergies - Many babies develop allergies to chemicals early on. Organic cotton is a non allergenic fabric. It also prevents irritation that can cause rashes. 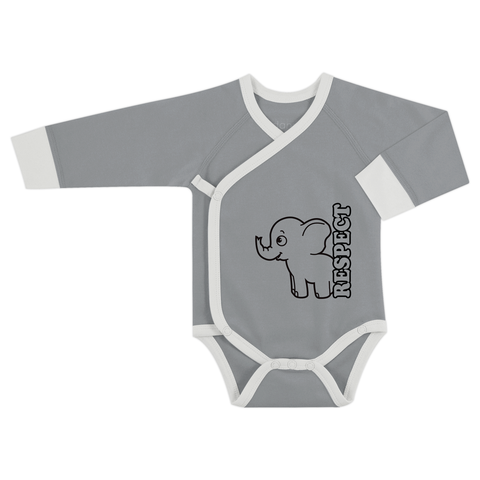 • Very soft and comfortable- Organic cotton fabric is used in making one of the softest baby clothes around. No worries on clothing rubbing harshly against baby’s delicate skin. • More durable and last longer - The organic cotton fibers that did not undergo chemical process can last longer and would not deteriorate just after few washes. • Easier to clean - Organic cotton fabrics are easier to clean compare to other fabrics. A mild baby detergent and some warm water will be enough for washing.